Ah, Memphis. The blues-loving birthplace of rock n’ roll. The place where Elvis Presley, B.B. King, and Johnny Cash recorded hit albums; it all happened in this small city of about 650,000 people. Memphis sits tucked away in the southwest corner of Tennessee along the Mississippi River. Keep reading for some ideas of what to do in Memphis in 72 hours. Begin your day with an all-important piece of American history. Situated just four blocks from the Mississippi River, this museum is a must-see as it chronicles the full history of the Civil Rights Movement in the United States. The historical significance of the museum doesn’t stop on the inside, but extends to its physical location as well. The museum is built around the former location of the Lorraine Motel, which is where Martin Luther King Jr. was assassinated in 1968. If you’re looking for a major turning point in civil history, there is no better destination to start than here. After a short 15-minute ride, our next stop is Levitt Shell on Poplar Avenue. Every year the Levitt Shell presents more than 50 free concerts to Memphis citizens as a means of building up the community. Their hope is that through music and education, a diverse audience will be able to find common ground and create a sense of unity. Their concerts are offered every night from Thursday through Sunday. Fun fact, the “King of Rock and Roll,” Elvis Presley, performed his first paid concert at this very location in 1954. Bacon Maple donut, anyone? What about Red Velvet Cake? Oreo? Grab a bite at the shop with the most delicious donuts in Memphis. Its reputation is only furthered by its 9.3/10 rating on Foursquare, based on over 200 reviews. Sitting directly east of the University of Memphis and Memphis Botanic Garden, visitors begin their day a little farther away from prime tourist areas, offering them a nice break before enjoying the rest of their day. Care to take a walk through the home of “the King of Roll and Roll”? Since it opened to the public in 1982, Graceland has hosted millions of visitors from every state and countless countries around the world. The peak season for Graceland visitors is from late May through Labor Day with the mansion seeing an average of 2,000 to 3,500 visitors per day. Visit our website at booktravelbound.com (U.S.) or gotravelbound.com (CA) to view our Graceland Mansion Tour which will take clients from Elvis’ humble beginnings through his fast rise to superstardom. Clients will have the opportunity to see personal mementos, stage costumes and movie memorabilia. This tour should take a few hours and be an absolute highlight of any trip to Memphis. One of our good friends, a Memphis native, said The Bar-B-Q Shop has the “best barbeque sauce in the history of the universe.” He obviously was not alone in this line of thinking, with the Food Network ranking The Bar-B-Q Shop’s pork ribs the number one overall barbeque dish in the United States. The secret is said to be in their barbeque sauce, which has won multiple awards throughout the years. Hopefully visitors go to this lunch with an empty stomach, because they will definitely leave wanting some more. 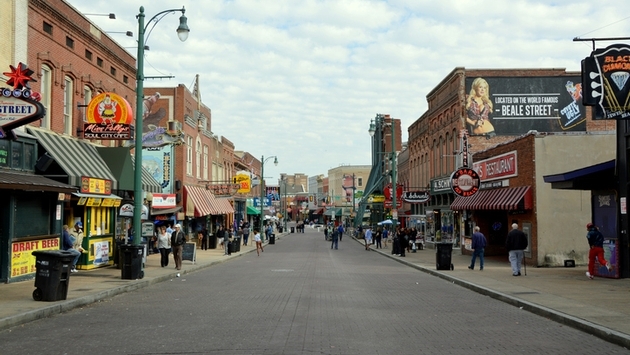 USA Today voted Beale Street the most iconic street in America. It has a wide range of activities ranging from bars to live music to smoky barbeque. This attraction has outdoor concerts and clubs. Aside from its booming nightlife, Beale is also well-known for hosting the Beale Street Flippers, a team of acrobats whose moves rival those of Simone Biles. This may be visitors’ best opportunity to immerse themselves in Memphis culture as all of its best attributes are mixed into a 1.8 mile-long street. Try eating breakfast directly along the Mississippi River. Paulette’s location couldn’t be better, and its inner atmosphere tops it off. In what many refer to as a romantic or intimate setting, this is the perfect spot for couples but still works for families, too. With unrivaled service and delicious food, Paulette’s is great for any meal of the day. Luckily for you, your day starts here. Overton Square went from booming, to empty, to bustling once again. In the ‘60s and ‘70s, Memphians spent their time here exploring the beautiful art that lines the streets. If visitors were lucky, they may have even seen Billy Joel perform in concert. After a few years of abandonment, Overton Square is now home to countless restaurants, festivals, theaters, music performances and stores. Broad Avenue is shopping-central in Memphis and is also part of the Arts District. Similar to Overton Square, it transformed from a large, mostly empty space into a booming area between Hollywood and Scott Street. Aside from its countless stores, visitors can also indulge in a variety of restaurants and various studios. Since Overton Square and Broad Avenue are only a five-plus minute ride away, they complement each other well to enjoy a relaxing afternoon. The Memphis Grizzlies are a team in the National Basketball Association. Their pace of play is typically a bit slower than most modern-day teams, but their bruising style of play matches the toughness of native Memphis citizens. Their team sees a good amount of success, too, having made the playoffs the past six consecutive seasons despite having a dearth of talent. Just a short walk from Gus’s Fried Chicken, what better way to cap off a night than with an exciting game of NBA basketball at the FedEx Forum? Jimmy Sanzone is the Marketing Coordinator for TravelBound, with a strong focus on curating content and building educative tools exclusively for the travel agent community.